Livestock and feed specialists with the Saskatchewan Ministry of Agriculture have learned that not all methods of testing water quality are equal, especially when it comes to total dissolved solids and sulphates. Leah Clark, livestock and feed extension specialist with the Saskatchewan Ministry of Agriculture, took part in a study comparing the accuracy of water quality measurements taken by hand-held meters to that of laboratory testing. This study was conducted by provincial specialists with the help of Phil Bailey and staff at the Roy Romanow Provincial Laboratory, as well as the Western College of Veterinary Medicine at the University of Saskatchewan. 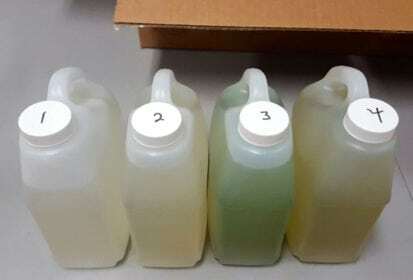 In samples of Saskatchewan dugout sulphates obtained and analyzed by the Roy Romanow Provincial Laboratory, 40 per cent of the samples fell into the Good (0-500 milligrams per litre) and Satisfactory (500-1,000 mg/L) categories, 12 per cent were in the Caution category (1,000-2,000 mg/l) and 49 per cent were in the Not Acceptable (2,000 plus mg/l) and Death (7,000 plus mg/l) categories. One particularly deadly instance in the province made headlines in July 2017 when 200 head in a community pasture with poor water quality died of dehydration and heat stress. The total dissolved solids (TDS) in this water source reached 33,400 mg/l. A TDS of 5,000 mg/l and higher is considered unacceptable for cattle and will lead to health problems and or death. The level of sulphates was 24,000 mg/l, much higher than the threshold for death in cattle. While extremely high levels of sulphates in water can be deadly, Clark says the most commonly seen effects relate to metabolic interference. There is a wide range of symptoms to watch for, some of which can be subtle or difficult to identify. Facing trace mineral deficiencies, an animal’s immune system weakens. More cases of foot rot and pink eye could be one symptom. The 2017 Western Canada Cow-Calf Survey suggests 60 per cent of producers don’t lab test the quality of their water sources. Clark isn’t surprised by this finding. She often encounters producers who’ve never tested their water. The testing method used matters, however. In their study, Clark and other specialists took hundreds of hand-held electroconductivity measurements, then compared the results to a comparable lab analysis. What they noticed was some hand-held meter readings were less accurate when compared to the lab results. The more troubling explanation for the inaccuracies, though, has to do with the water’s conductivity, or ability to hold an electronic charge, which rises the higher the ionic concentration. Hand-held meters use a conversion rate to get a TDS measurement from the conductivity reading. However, conductivity isn’t always related to TDS, as different types of ions vary in the way they carry electricity, meaning each water sample will read differently. “Some of the electroconductivity meters that producers can get automatically convert to total dissolved solids, and what those meters are doing is they’re just reading electroconductivity and converting to total dissolved solids. That conversion factor usually is around 64 to 71 per cent, so that TDS conversion, from what we saw last year, is way off,” said Clark. It’s also important to remember that the water’s appearance isn’t always an indicator of quality. For example, a brown tinge may be due to iron, which doesn’t cause major issues in cattle. For producers who suspect that water quality is affecting their cattle, Clark stresses the importance of first testing the water. Provincial agriculture offices can help, as specialists can assist producers with testing. “Once we get that test back, we can help make recommendations on how to best use that water,” she said.